After all the excitement of the last week, we are looking to relax for a little bit and take some time to get some chores done. Ever since we've crossed over into Alaska, I've had Sean Bean's voice from "Game of Thrones" in my head, ominously warning me, "Winter is coming!" We've got to start heading south soon. 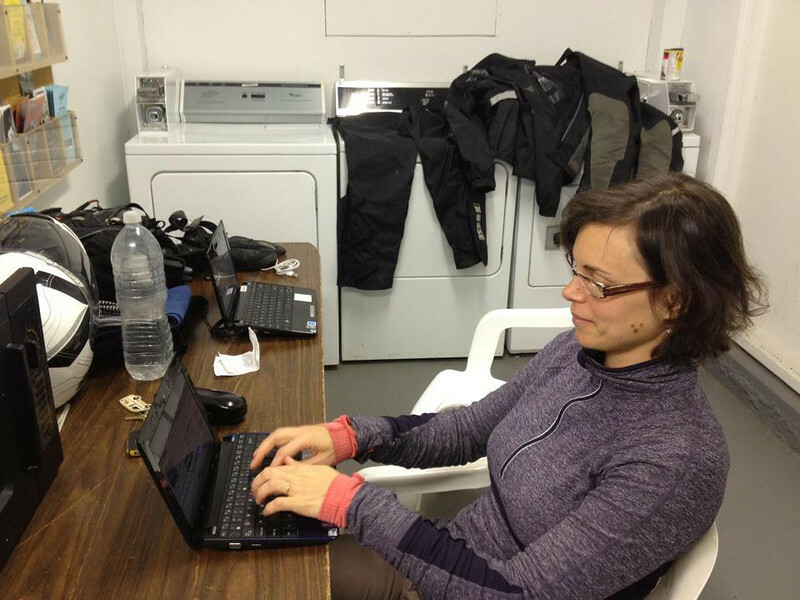 Chatting during laundry day. Our riding suits are clean again!!! 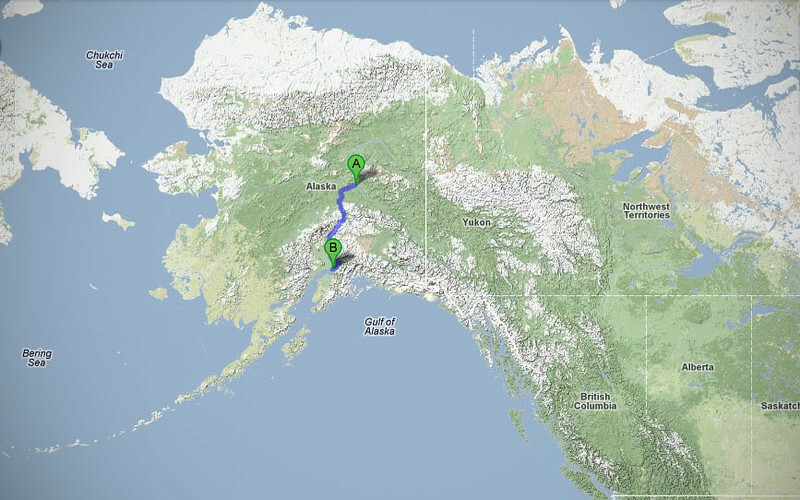 A couple of weeks ago, we tried booking our regular service at Trail's End BMW in Fairbanks, but we quickly found out that that was like booking an annual medical check-up at the emergency ward. Trail's End seems to be a triage for the moto-carnage towed back from the Dalton, those bikes too wrecked to run get preferential treatment, so we instead turned to The Motorcycle Shop in Anchorage, about 360 miles south of Fairbanks. Denali National Park is about halfway between Fairbanks and Anchorage, so we decided to stop by on the way south. We encountered high winds on the way there and we were often leaned sideways into the crosswinds. There were a few pucker moments when passing oncoming trucks - suddenly the crosswind would die and the bike would wobble into the lean... :( We were to learn later that this was an early warning of things to come. 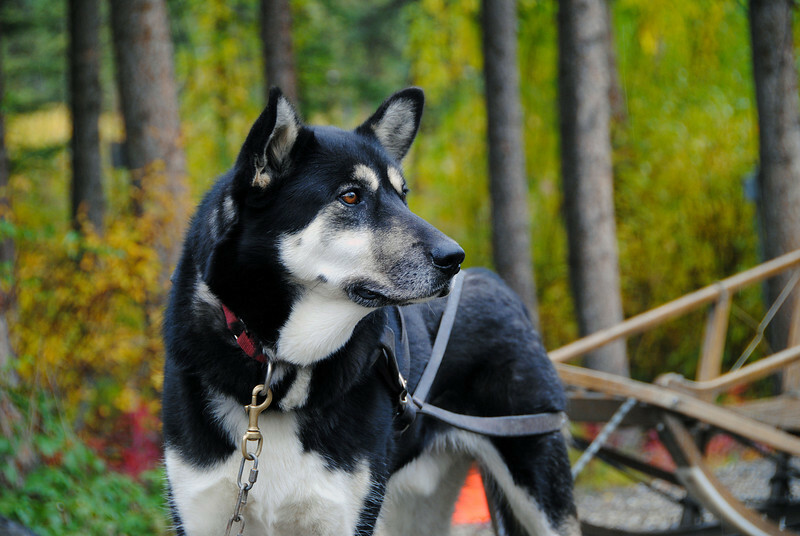 While we were at Denali, we attended a Husky sled dog demonstration. 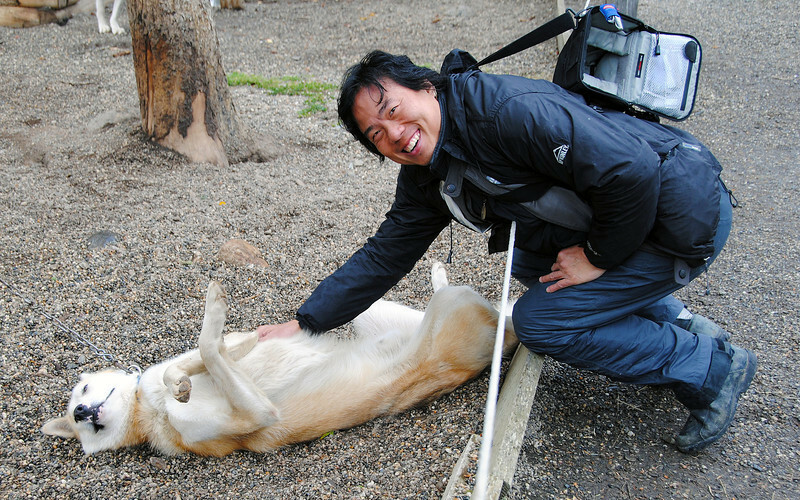 These dogs are so energetic, all they wanted to do was run. Definitely not condominium pets! They play an important part in providing clean and silent transportation for people and equipment throughout the national park for researchers and rangers. And they are so beautiful as well! I'm totally being used and I don't care. 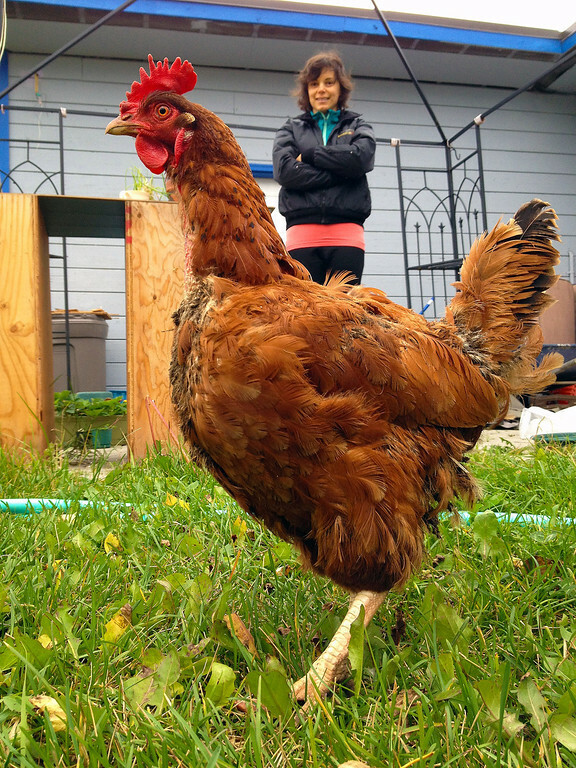 Maybe it was a hunch, but when we arrived in Anchorage, we made the decision to book a room instead of tenting it. 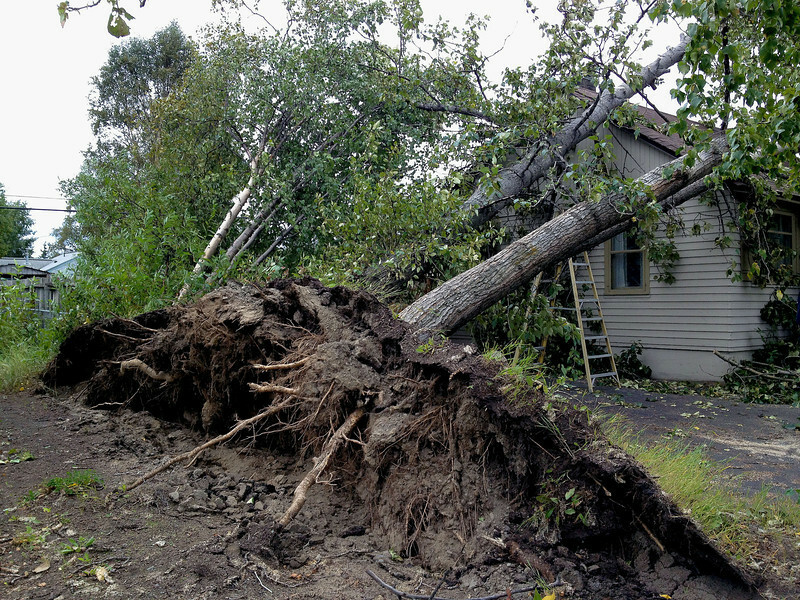 During the night, a storm whipped through the city toppling down trees and power lines. Weather equipment recorded 210 km/h winds before their data feed got cut. At the time, we were just finishing watching a DVD (we miss that talking picture box and how it can magically make time disappear) and I got up to switch the TV off. Just then, I saw a bright flash outside the window and then all the lights went out. The tree right outside was on fire until the rain quickly put it out! I thought it was a lightning strike until this morning, when we walked outside we noticed the falling tree had severed a power line and the arcing had set the leaves on fire briefly. If we had tented, we would have woken up in a tree somewhere in Oz. Thankfully, Neda's bike was in service at the dealership and the host let me store my bike in the garage. 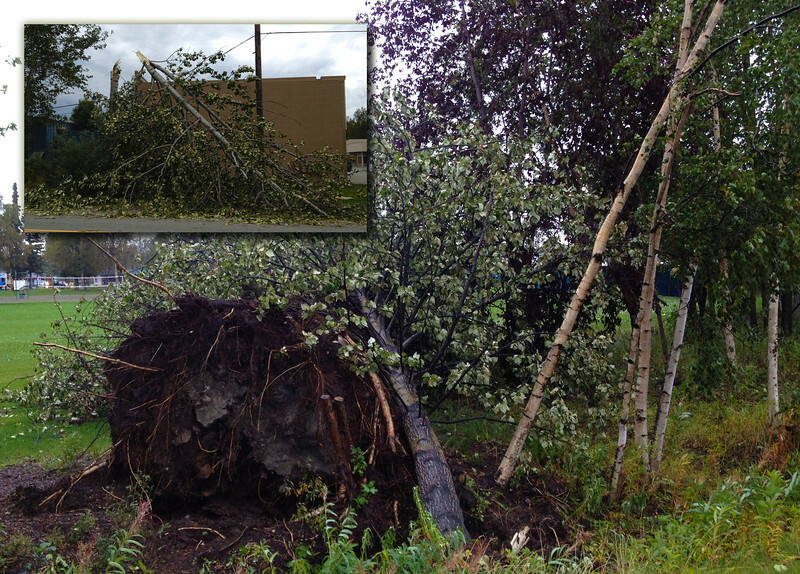 The wind was so strong it uprooted this huge tree! Our hosts told us it normally doesn't get this windy this early. A month later, these trees would have shed all its leaves already and have been better able to withstand the high winds. 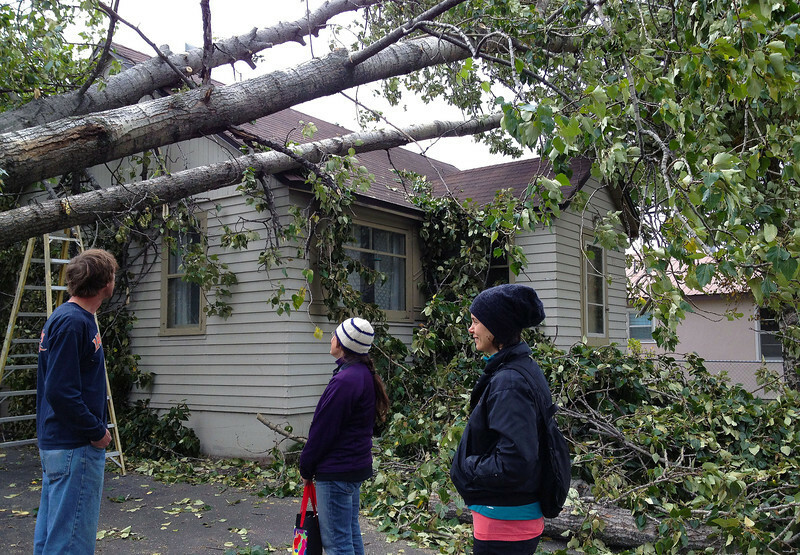 We learned from the news that 25,000-30,000 homes in Anchorage were without power due to downed trees and the local electric companies were working around the clock trying to restore service around the city. Romantic breakfast. The candle serves as both light and heat! So our BnB was unable to serve us a hot breakfast because of the power outage. 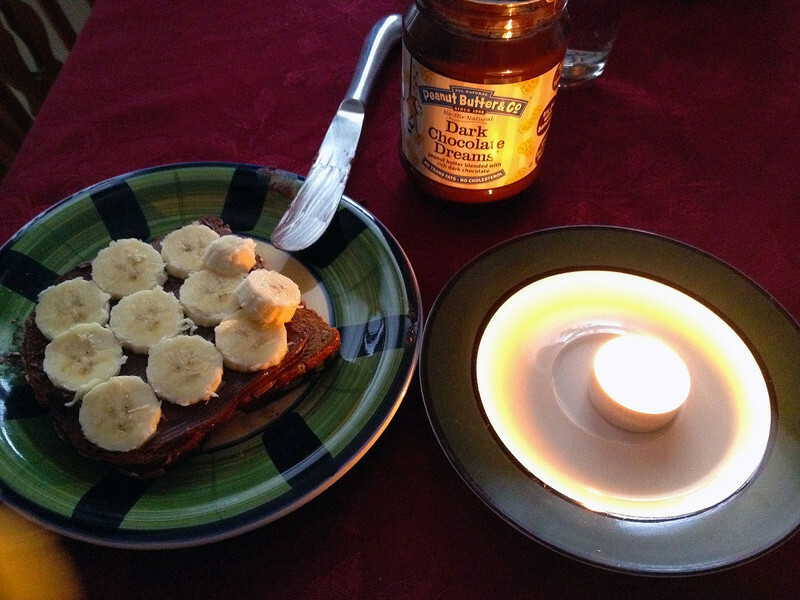 Neda feels they more than compensated by offering us chocolate peanut butter sandwiches with bananas by candlelight... Neda's kryptnonite is Nutella, but now she's found something else that will rob her of her willpower - Dark Chocolate Dreams Peanut Butter! 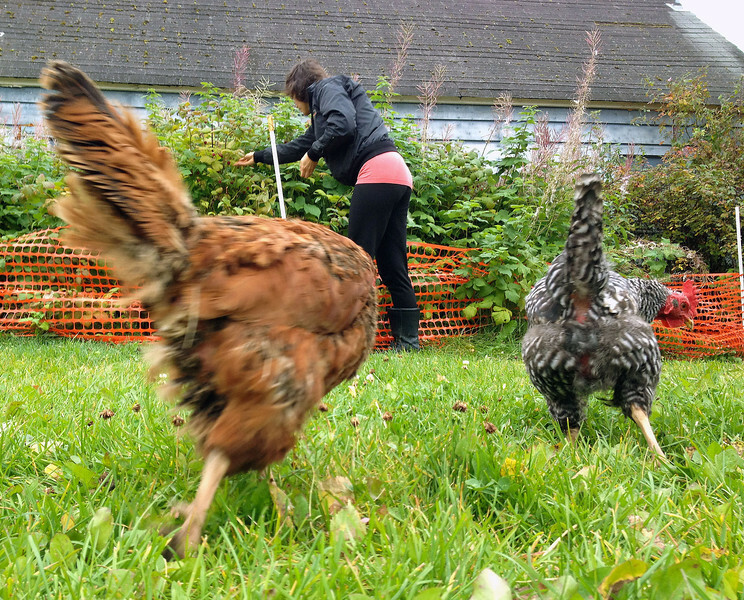 As soon as Neda starts picking berries, the chickens are on the move! 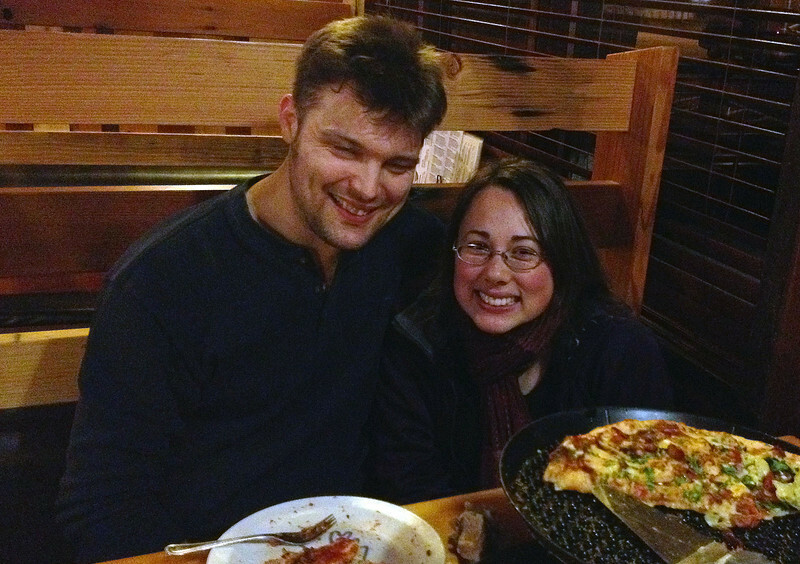 We really enjoyed our stay with Jana and Stephen, they're a really wonderful couple and they treated us like old friends instead of boarders. We asked them where Anchorageans go for a vacation - secretly hoping they wouldn't say Hawaii... They gave us some great ideas for local destinations to head out to.